China may be modernizing at a break-neck pace, but the quicksilver skyscrapers and bullet trains are a thin veneer. The world's oldest continuous civilization is bound to pull a cultural artifact or two out of its hat. Ponder the legends surrounding the Forbidden City, let your imagination fly on the Great Wall and dive into a culture thousands of years in the making with a custom designed China tour by the travel experts at Global Basecamps. See the highlights of China in this quickly-paced itinerary, including the cities of Shanghai, Beijing and Xian. Make a stop in Chengdu to visit the famous Panda Center. Despite the boom in tourism for China, there are still destinations relatively free from international influence. Get off the grid in this itinerary, and then return for the modern highlights in the second half. Explore China's modern cities, Shanghai, Beijing, Xian and Hong Kong. China's modern culture is focused on progress and optimism. No where is that more relevant than in this itinerary. There are a lot of extremes describing the Great Wall of China. Its physical immensity, its age, its artistry and architecture, all add up to an unforgettable experience. So much so in fact, that tens of thousands of tourists see it every day. Global Basecamps travelers avoid the crowds. While everyone else congests the fully restored parts of the Wall, our travelers venture off the beaten path. Get up close and personal to this Great Wall, and enjoy it all to yourself in one quiet, perfect moment after another. The cities of China are where one finds a country ready to dominate the new century. In Beijing, Shanghai, and Hong Kong, epic skyscrapers host a population fiercely proud of their history, and equally proud of their modern accomplishments. For the traveler, this translates into a substantial, ancient culture ready to be explored. The eastern parts of China get all the press and publicity, but this is a big country you’re about to explore! Traveling along the ancient Silk Road that eventually led to the Mediterranean Sea, you can see a side of China that few foreigners experience. The food here is different, as is the music, the language, the art, and just about everything else. This is a trip away from the beaten path, away from the tourist crowds, and away from everything you thought you knew about China. 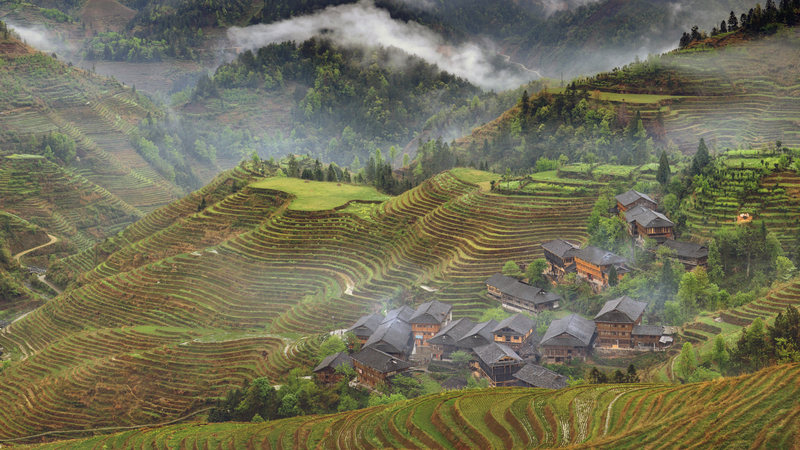 There are experiences in China that cannot be had anywhere else in the world. Global Basecamps travelers have cuddled with pandas in a breeding center, they’ve trained with Shaolin Monks in the art of Kung Fu, they’ve bicycled through jaw-dropping karst landscapes and rice fields, all the while embracing the tangible energy of a massive and growing country.